We Work With You To Realize Your Business Goals. We believe that your insight and participation is an important component of the brand-building process. We work with our clients to understand their business goals, identify and research the competition, analyze customer satisfaction and determine growth opportunities. 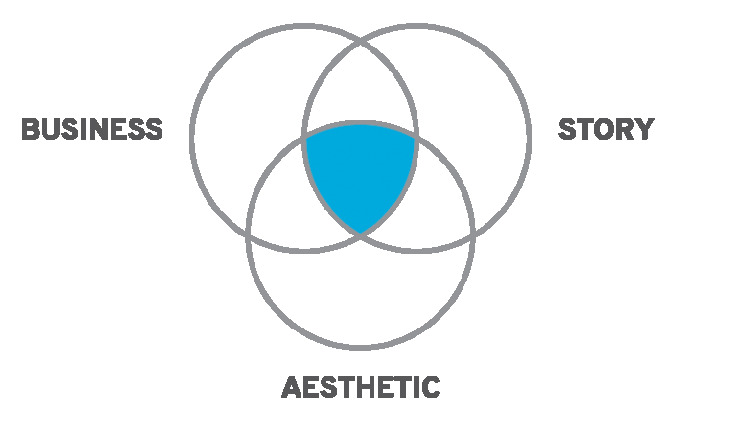 The balanced intersection of Business, Story and Aesthetic shape a brand and form the Unique Brand Proposition. The symbiotic relationship these 3 pillars share is essential for bringing your brand to life and forming the building blocks for the evolution of your brand. We apply these 3 essential pillars of branding to everything we do. BrandGPS® is our bespoke process that defines a strategic approach for business growth. Learn more about BrandGPS® here.